Preface of the weekly essay. It was about two years ago when I commenced Tokyo Strolling Society, "Tokyo Sanpo no Kai". Since then, I have spent much time walking around. Although I was born and brought up in Tokyo, I was not much fascinated by this sprawling city. But I love any city atmosphere where many people from all walks of life and culture mingle freely. When I was a university student, my interests were towards Europe, especially Britain. I made several trips to learn the British and European culture. My first job in Japan was editing an Asian business magazine and I was proud of it, interviewing many Asian business leaders and ambassadors. As I acquired a deeper understanding about foreign countries, I got a subtle feeling that I could enjoy Tokyo more. I might have lost an excitement by ignoring our capital and that was the reason to start this Strolling Society. To look around ourselves more carefully and to pay attention to our local landscape and buildings are present trends. When one goes to a bookstore, one can find many magazines and guidebooks to show Tokyo's streets and quite a few groups or local offices organize walking tours, too. There is also a movement to review our city planning. Shinjuku ward selected 13 special sites which had been all nominated by Shinjuku citizens. The selection of those spots shows how this ward has historical diversity. Many people may only imagine entertainment areas near Shinjuku station. However the Shinjuku area is quite big and has many faces. Of course one can enjoy walking and shopping through busy streets and feel how one is metropolitan, but one should experience more before judging Shinjuku. Tokyo was largely destroyed by the Great Kanto earthquake and again in World War II, but fortunately several old temples and historical buildings still stand. One of the residential areas, Shimo-Ochiai is exclusive and you will see big old houses which are still lived in. The local towns' names in the Ushigome area, where small traditional shops in narrow streets remain, are very old and they represent Edo geography and show who lived there. Our philosophy is by walking around Tokyo, we can better realise and digest its wonderful mixture of traditional Japanese character together with its contemporary and international flavour. One may use subway or train to move in Tokyo, one probably just got the tip of the iceberg. If one is busy doing one's job and goes through life, one will get nothing out of it. If one walks, one can see, smell, hear and feel and one will get something new. I will write about exciting things I discovered and I would like to share my joy. Near Edogawabashi Station of the Yurakucho-line, at the corner of a highway exit, I crossed the bridge over the Kanda River to enter Edogawa-Park. The Kanda River, in this area between Koishikawa-Sekiguchi and Iidabashi, used to be called Edogawa(Edo River). Making paper and dyeing cloth were the main industries to use the clean water here in Edo period. Cherry trees have been famous since then and the local people still gather to have parties on a strip of the park which runs down to the river. This park is usually quiet, only that cherry blossom season, it changes completely into a big party room. No one, however, gathers when plum has blossoms. I like plum trees better, because it has stronger and better smell and few people gathers to see them in the quiet atmosphere. Only a boy and his father were playing when I visited it. Under the plum trees with trees' good smell, the child rode his tricycle. Walking along a promenade from the park, passing by the back gate of Chinzanso, I turned the corner to a steep slope, Munatsukizaka which was opened in 1697. The slope is so steep that people walking near here should realise this town is hilly. In the midst of the slope, there is a tiny shrine Sui-Jinja. One could fail noticing this because it is very small. Turning right onto Mejiro-street, I faced the front of Chinzanso. Due to a new building of Four Seasons Hotel added to the original building, the garden got smaller and old people who remember the past sometimes say the garden used to be bigger and more beautiful. A couple of months ago, I heard two old ladies talk on the Yamanote Line that the hotel really changed the garden. One can either enjoy viewing the garden, having a cup of tea in the luxurious lobby, or one can walk around the garden. There are a dark-coloured wooden three-storied pagoda, an old well and stone sculptures of the seven gods of good fortune. The hotel holds an event to let their guests collect seven stamps at those spots in the new year season so as to encourage customers to come there. On Sunday afternoon, the hotel seemed filled with people attending wedding parties. I saw a bride in white. Everyone inside the building was happy. Through such shining happiness spread lobby, I went out to the sophisticated garden. Despite the small number of plum trees, it was not so bad to see them, stretching their branches over a pond. Today's cosiest place was St. Mary's Cathedral, Tokyo designed by the famous architect Kenzo Tange. The cathedral was outstanding, in fact I could notice the high bell tower in distance. The surface was covered with silver plates to make the building magnificent. There were a couple who seemed to be having a meeting to arrange their wedding ceremony and a group of three students who looked like they were studying architecture, inside the cathedral. After they had left, I sat down and spent a quiet time, looking at a big cross of the cathedral. The ceiling was very high and it looked as if every thing in the universe would have been absolutely absorbed in it. Building viewing is a good excuse to have a walk. When the Japanese go abroad, we carefully look at structures, bridges or castles which are different from our style of buildings. If one has the same attitudes even in one's own neighbourhood one can see it in a new perspective. One easily can find an old house between newly constructed tall buildings or well decorated small apartment with pretty garden. I do not have enough knowledge to judge good design or poor one, yet I just feel whether they fit my sense or not. If I decide I like one, I would go to the place again and again. I saw a cute billboard of an earthenware shop in Mejiro Street. Everything in the shop seemed new and wall and display boards had no stains. Artists' made sophisticated figure vases, beautiful plates and funny shaped cups were displayed. All were pretty. When I stepped up to the first floor of the small building to enter the shop, an old gentleman who sounded a regular customer talked with the shopkeepers. He told them that he would like to prepare gifts for his own funeral, although he had not got a certain idea what would be good or even when he would die. The gentleman and I left the shop at the same time and I smiled at him when he saw me. He told me that he often came here to see the earthenware. He seemed to enjoy talking with the shopkeepers who were of his grandchildren's generation more than browsing in the shop. From Mejiro Street, I went down to Yureizaka. Both sides of the narrow slope were lined with high walls and it was dark even in the early afternoon. Walking along it, I made it to my last destination, Shin-Edogawa Park. This used to belong to the Hosokawa family. The small garden has a pond and one can enjoy walking along the paths which surround it. A wild hilly part of the garden, which I thought it was like a maze, is densely wooded, so one cannot see beyond and one may wonder which way one should take. A Japanese style house which was built in Taisho period stands behind a red plum tree with sprays. A middle-aged couple looked gently at the blossoms. The husband took photographs, telling his wife that they were against the light. There were only several old people there so it was very quiet and I determined to read a book in this silent garden when the weather gets milder. Going toward Waseda Station of the Arakawa-line, I walked from Mejirodai to Takada. They are next to each other, but their characters are quite different. I saw more great houses with big gates in Mejirodai, on the other hand, more small flats and an unique shopping street in Takada. I shall write about Takada another time. *There are more places to visit. Eisei-Bunko, Basho-an and Kodansha-Noda Memorial museum. If anyone has the time and the interest, please drop by at those places. What would you do in your spare time when you travelled out of Tokyo on business? In February I went to Osaka on business to visit a factory. I had an appointment at two o'clock, so I wanted to arrive at the city early morning in order to have a walk around it. If I had a whole day and I knew that place well, I would have just explored a certain area without any particular plan, using only my instinct for searching for something interesting. Yet I had only about four hours and did not know Osaka well, so I referred to a guidebook and a Tourist Bureau's website to arrange half a day's tour before I launched my trip, to make sure that I could visit some wonderful spots. I decided to walk in the area of Nakanoshima. One of my friends, who was about to earn her doctorate for the history of architecture, suggested that I should see the modern buildings in the centre of Osaka city and some bridges over the rivers where merchants used to make deals. Some say Osaka is similar to Venice because there are many canals and rivers which used to be the main transporting way. Even today people can enjoy walking along the riverbanks, they look pedestrian-friendly, although there were not many people about as it was a cold rainy weekday. The first step out of the Kitahama subway station was in front of the Osaka Stock Exchange. The entrance of its round shape building was shut and the door was blocked with a thick rope. I wondered, "is this building not being used anymore?" I started to walk around it and looked for a door through which I could enter, but I failed. There are many stockbrokers who have a main office near the Stock Exchange. Some of them still work in their original buildings. A lion statue stood vigorously at its approach as if it has always saved the Namba bridge guarding in the front of the Stock Exchange. I crossed the bridge which was one of the oldest major modern bridges in the city, and turned left toward Osaka Prefectural Nakanoshima Library, which had four columns at the front. According to the guidebook focusing at the modern architecture in Kansai area, the library was donated by a rich merchant Sumitomo family and opened in 1904. The building itself was registered as one of the national important cultural properties. In the centre of the building, under the stained glass dome, I stood still and I saw a beautiful dark brown wooden spiral staircase whose banisters were polished well, that original shape of a staircase is not usually seen in an ordinary public library. I stepped up the dark stairs and I felt soft light entering through the glass window, thanks to the darkness of the stairwell, the light was so precious. I looked downstairs leaning on the handrail for a while. I spent plenty of time browsing through several books on post war Osaka. The library had many materials about this historic metropolis. They also showed several books of their collection in a showcase. Then they featured Kenkado Kimura, who was a talented Osaka merchant of rice wine and scholar of literature in Edo period, commemorating the two centuries since his death (in fact, he died in 1802). When one reads his diary, one can see why many people were attracted to him and respected his character and knowledge. I suddenly realised how long I was in the library, and I went out of the building and started to walk again. Next to the library was the City Hall, which also had columns, and crossing over the Midosuji Street, another big building with columns, the Bank of Japan. When I showed the pictures of those buildings to my friends who had never been there, they thought they were taken in Europe. I imagined that every stone building reminded them of Europe. I would like to know what Europeans think of our buildings which imitate European style and which were built in the Far East. I crossed the Higo bridge over the Tosabori river, noticing a huge mass of square sandy grey blocks. It was the main office of Sumitomo Bank. I felt the wall would continue forever as I passed it by. I turned right into Midosuji street at the corner of it. 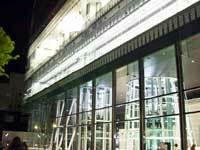 I saw a white building with its long linteled windows, which were outstanding and conspicuously horizontal. The corner of the building was rounded and I felt it was beautiful, checking it up on my map. I found out that it was the Osaka Gas Building which had been constructed in 1933. According to my guidebook, it was one of the most beautiful office buildings in Osaka, and I had to admit it. No one however seemed to care about it and everyone looked at me reckoning I was a complete stranger because I stood on the corner and took several photographs of it. I was quite satisfied to see it. If I had had more time, I would have gone inside. Just before I headed to the factory, I wandered off towards the subway station walking through the narrow streets in Dosho-machi where there are many modern medicine companies and small pretty hospitals. I enjoyed my morning walk in Osaka before my work. My factory to be found was in Tsuruhashi where there is a Korean market surrounded by many Korean barbecue restaurants. I went there a year ago, and enjoyed Korean snacks while my friend and I looked into the small shops in the market. Remembering them, I came here to have some, but most of those shops in the market were closed on Wednesdays so that I could not pick up anything. My free time was over when I saw my boss. Many young couples enjoy viewing lit-up bridges and buildings in Yokohama, which is one of their favourite destinations. Frankly to say, they do not exactly see the lit-up structures. They gaze at each other indulging in their love with their partner and they just glance at lit-up monuments which make their theatre for their drama vivid and more romantic. Yokohama city, where there are many historical buildings and fascinating areas, has a project of conservation of them and lights up some of the famous ones, co-operating with other public and private sectors to attract tourists. In fact it works very well. One can see many people walking in the evening in the park or avenues and the city looks outstandingly unique, thanks to the mixture of modern European style of buildings and contemporary fashionable designed skyscrapers. One can also read articles which praise these sites on various magazines. Tetsuro Odashima, a Yokohama city official has organised a tour for students who major in gardening, landscape and city planning, since 1999. I joined the tour this year and walked around the city with students listening to his lecture. The number of participants was quite big and the students were very enthusiastic to know the geography of Yokohama. Of course, city planning needs complicated knowledge including the history, geography, climate, economy, and residents' interests. A city has layers of history and people change it as society changes, that aspect should not be ignored. I believe that walking is the one of the best ways to know the whole of the city, so this project to encourage students to walk around with a lecture of the present project is wonderful. I showed my Yokohama friend the plan of the tour, which would start at four o'clock and would be scheduled to end at nine. She said that the plan looked very tough to walk. Yokohama local people would not join such a long walking tour partly because they know that the city is hilly and partly because they prefer to drive. As a city wanderer, the plan was not hard and I knew the course covered only a distant of about five kilometres. However the students walked far behind from the organiser Odashima who was also accustomed to walk and me, and they seemed very tired at the end of the tour. The tour members met at the Ishikawa-cho station and headed to the first destination Yamate Italy Garden where Italian consulate stood between 1880 to 1886 before they moved out, and there are two modern buildings which are open to public: Bluff no.18 and the Home of a Diplomat. Walking along the Yamate-Hon-dori Street, we saw the Erismann Residence which was designed by Czech architect Antonin Raymond, renovated. It was built in 1926 and it was rebuilt in 1990 inside Motomachi Park. The park was opened in 1870 and tennis was played for the first time in Japan. At the corner of the park we saw the base of a brick building lit up. It looked a ruin which made me feel ancient world although it was built in modern period. We dropped into Bluff no.234. It used to be an apartment which has had four residences for foreigners. Now Yokohama volunteers organise several events there. Then an exhibition of artworks of students from Yokohama schools was held. The rain had almost stopped when we went out. We headed toward next place, Minato no Mieru Oka Park where there used to be British navy camp when Japan opened the Yokohama port. The British council whose building is now registered as cultural asset of Yokohama was here, too. One can open a concert or an event in this British House Yokohama. From the park, we enjoyed the view of lit-up bridges. Odashima explained that one express way route was changed not to destroy the good view. Everyone was astonished by the fact that Yokohama city was keen as mustard to keep good sight. Yamashita Park is very famous for a statue of a girl who wears red shoes and everyone might know the famous song of the girl. A numbers of couples flocked to the park and saw the port arm in arm. Our party walked through them and we saw the Hikawa-maru ship which was called "Queen of Pacific" due to the beautiful figure. When we looked Bay bridge and Tsurumi Tsubasa bridge, the colours of the light changed. Yokohama's three famous nicknames of buildings are Jack, Queen and King. From Nihon Boulevard one can see all of them. Jack is a memorial hall, Yokohama Kaikou Kinen Kaikan, Queen is Yokohama Customs and King is Kanagawa Prefectural hall. I was fond of Queen the best among them. The tower is the highest and nearest to the port. One first sees the back of the building from the way, but one should go around it to find the front because the tower was designed as it should be looked at from the sea. The street called Kisha-michi was opened in 1911 as a railway to carry goods from customs to Yokohama station. Two bridges which were originally built when the railway was opened was set up in this pedestrian promenade. A hotel is designed as a gate and it looked as if it invited casual strollers to take a walk in the street. Students showed their interests in the choice of light. Some was lit with orange light and others were with white light. Famous light designer paved with lights in the street along the Yokohama museum, the area is called the Art Square "Bijutu no Hiroba", however several of them were out of work. It was said that they could not be repaired easily. Design sounded supreme. Yet city planning needs not only good design but efficiency. The last place we visited was Pacifico Yokohama and Seaside park. Those were opend in 1991 in Minato Mirai area which was developed recently. At the end of the tour, participants got tired after four hour walk but we enjoyed the tour very much. We learned how Yokohama city has devoted the power to preserve old buildings and develop new area with great care for good design to encourage more people to visit the city. Chuta Ito (1867-1954) is considered as a pioneer of history of Japanese architecture as well as an unique architect. He travelled around in China, India, Persia and Europe for three years. His purpose was to search for the origin of Horyuji-temple. After he came back to Japan, he became a professor for the Faculty of Architecture at Tokyo University. He wrote several theses about architecture, especially about Horyuji and how building styles had developed. His first thesis was the beginning of discussions in Japan about architecture. He designed buildings as well, inspired by Asian styles. There are several buildings and monuments designed by this great architect in Tokyo. Tokyo Strolling Society visited some of them. Dr. Shunsuke Kurakata, a lecturer at Waseda University Graduate School of Science and Engineering, is a historian of Japanese architecture, specialising in modern architecture and Chuta Ito is one of his subjects. Dr. Kurakata, a member of our group planned this tour choosing several buildings to pay visits to and gave us a lecture while walking. This programme attracts many people's attention. The number of the participants was twenty five, the largest since we started this society. Some of them came from Kyoto and Otsu. We met at Kudanshita Station at a quarter to ten and we departed to Yasukuni-shrine. There are many white doves in the shrine and a group of nature loving devotees takes care of them. The museum Yushukan exhibited treasures of this shrine and war materials. The present building was constructed in 1930-31. Two plates of devil's face welcome visitors at the entrance and monuments of imaginary fish which are usually set on the roof of Japanese castles were here placed at the pillars on both sides of the building's entrance. When we walked inside, I noticed a symbol of a heart at the top of a newel post. Dr. Kurakata explained that Chuta Ito was fond of using this symbol. We first thought it was from Europe, but it had been used traditionally by the Japanese. Frankly to say, we felt a bit depressed when we saw several monuments commemorating World War Two. At that time they exhibited hundreds of letters from soldiers who later lost their lives in the war. Kudan area has many places to remind us of the war. We boarded the subway to go toward our next destination, the Okura Shukokan Museum of Fine Arts near Toranomon station. The museum was inside the Hotel Okura. The building looked Chinese and was ornamented with several monuments of imaginary monsters. Many reliefs on which the face of a dragon was carved were placed on the surface of the ceiling. The dragons looked as if they glared at us. The Hotel Okura itself was well designed and an editor of a high quality magazine told me that she liked the salon very much and she wanted to use this site to take photos for her magazine. It was very cosy and I imagined I could have sat there for a long time just doing nothing or gone to sleep. Chuta Ito's most famous work was the biggest building which we had visited in this tour: Tsukiji Hongwanji-temple. Its construction started in 1931. The temple had an Indian exterior. Some experts wrote that it was not genuine, but the style reminded the Japanese of a really exotic temple. Both wings had towers resembling an Indian stupa. There were many animal monuments, inside and outside of the temple, which characterised his work. Two stone lions with wings stood by the outside steps. The spiral of lion's fur on the statues was very cute. When I went inside, I noticed a beautiful stained glass window of lotuses. I liked it very much and I took several photos of it. Everyone was excited to listen to Dr. Kurakata's explanation that the building had many animals. We followed him stepping down to the worshippers' lobby and we found each animal stood on the cap of every newel post in the staircase. We looked carefully at those carvings of a cow, an elephant, a lion, a horse and a chicken and a monkey sculpture looked out as if it supported the corner. Some worshippers noticed these strange observers and pointed us and laughed secretly. Of course we had a sincere feeling and before checking those monuments, we paid our respects to the temple, however, we looked outstandingly curious and odd for ordinary people. The last place we visited was the Kanto Great Earthquake memorial hall and a museum about the earthquake. A curator who came from Otsu told us that the hall seemed to endeavour to follow Zen-style and he pointed out that the columns had a decoration resembling a lotus and that the tile was paved inside the temple so that people could walk in shoes. The structure had a three storey tower to contain bones of the victims of the earthquake and a hall with a high ceiling. Chuta Ito was a judge of the competition of the hall and the judges decided the winner but Ito decided he himself designed it. In the museum next to the hall we could see the plan and perspective of the originally selected designs which were later abandoned. When we looked up just after we entered the hall, we were very pleased to notice very pretty brackets. They had long ears like rabbits and big noses like pigs. One lamp was lit and the other was not, so we could see the effect of the light on the monuments. Several monsters looked down from the tops of the columns of the museum. According to a book on Chuta's work, the pose came from monsters which usually were on Gothic cathedrals. Except for these monsters, it was not so characteristic building. Inside it there were displays about the Great Earthquake and World War Two, stressing how terrible they had been. Probably I was not careful but I could not find any exhibits which mentioned how many Koreans were killed by Japanese during the disturbance. I guessed the museum was for only the Japanese victims and their relatives, although I believed this kind of museum should include our negative past, too. Many charts in the showcase were mainly made by the Tokyo University of Agriculture. We would have liked to have known why the university was involved because many students of the university had joined the tour. If someone knows the reason, please contact me. During the walking, we felt former warmongering Imperial Japan which wanted to make Utopia throughout Asia ignoring our neighbouring countries' will. One of the heaviest topics to face made us a bit unconfortable. Yet we were very pleased that we could see great modern architect's buildings. Everyone agreed that we would not have visited those places unless Dr. Kurakata had made such an interesting plan. The tour ended very successfully and gave all participants great satisfaction. In this mountainous area, Chichibu welcomes late coming spring now. Almost one month after the Tokyo plum trees start to blossom, those trees open their blooms at the end of March here and cherry blossoms will start in the second week of April. I visited a small village Ryokami-mura in a valley of this quiet countryside. The weather was fine and warm. I indeed realised that spring has come even here at last. It was a perfect season to feel the nature. There are always many people wearing hats and heavy boots with rucksacks flocking to Chichibu to enjoy hiking in the mountains or making their pilgrimage to 34 scattered temples in the area and have a bath in a hot spring. However spring is a gloomy season for some people, especially for those who have hay fever. When I got out of the train at Seibu Chichibu station, I felt there was a high pollen count, although I do not usually suffer from hay fever. There are many cedar trees in the mountains and they started to pour their magic powder to make people sniff throughout the area. If one has hay fever, one should visit Chichibu later. My friend and his family live in Chichibu and I often go there accepting their invitation. They invited me again in this flower season. We usually have a walk near their village and sometimes in the summer we swim in the pool which they make in the nearest river to their cottage for their daughters. I would have liked to explore this time as well, because everything in countryside is attractive to a city dweller. So I got up early enough to have a morning walk. My friend and I left their cottage about 10 o'clock and we started our walk along a road which started by the entrance of his cottage. This road has been under construction for more than five years. The road-making seemed never to end. Every time I come here, it has been stretched beyond up the village into the mountain, besides some spots have landslide because the soil was cut and the concrete was not able to hold it. It would be very difficult to get through with the work to dig up a road in a steep mountain. The construction might provide local people with jobs, but it could not contribute anything to the area. I have not seen even a single person walking there except for us. Instead, we saw steel structures, wires and abandoned rubbish. One of the wells of the village was near the road and people are afraid of the pollution. The project has completely destroyed this beautiful nature and the ugly concrete and wired earth make the view awful. Although these materials were placed in order to prevent landslide, they could not hold the land. The pressure of the mountains exceeds these artificial protections. The view of the roadside yet seemed natural and wild for me as a Tokyo person, but my friends already noticed that no animals have appeared in the village since the construction started. They guessed that big noise by cutting the mountain or dumping the soil, and lorries frightened deer, monkeys and many other smaller animals. They are easily afraid of human beings and they go away. It has happened all over Japan, sadly to say. We have to watch out those kinds of civil projects carefully and we should decide what is necessary or not. After we walked down to the village, my friend guided me to the old original main street. It was absolutely cosy comparing with the new road, because it was not very wide and it was meant developed mainly for residents and it fit the geography of the area. There also are several narrow roads which are not paved. I stepped on the dried leaves, feeling the soft soil. That was much better than an asphalted road to walk in a fine day. When one drops into a Seibu Railroad station, one will notice many posters on a billboard to encourage people to visit Chichibu. Some companies prepare several plans in the area. It is one of the best destinations of a one-day trip near Tokyo. As they promote tourism, there is famous spot in the Ryokami village, too. It is a field of Setsubunso which has tiny flowers in February and March when Japanese traditionally celebrate to welcome spring. Many tourists visit the site to see the pretty flowers. We saw them outside of the quarter and took a rest having a sweet hot drink made of rice and sat on the step of the entrance. When we went back to my friends' cottage, we wandered along a river and crossed three times. We waded through the cold water. The depth of the river was just below my knees. It was quite an adventure. I used a thick stick to keep me from falling down. It was about a three-hour walk and it refreshed me, although my friend's daughters said to me that it was pity to be taken to walk such long time. They sounded they did not appreciate this lovely countryside. Probably they took it for granted as if I was accustomed to live in convenient but dirty environment. Anyway I usually get up early and love to walk therefore I did not have any problem of the excursion. * We in T.S.S. organise walking tours once a season. We are interested in the city, architecture, art, history, theatre and everything cultural. This spring, we are planning to explore a temple and buildings which were designed by a great modern Japanese architect Chuta Ito. We sometimes go out of Tokyo. Everyone will be welcomed. Talking about contemporary architecture is now fashionable. In fact many fashion magazines now feature famous architects and newly designed and constructed buildings. Partly because many top brand fashion companies ask these famous talented architects to design their offices and outlets. I have an idea that people are fed up with buying new clothes every season and they divert their interest to architecture and furniture designed by prestigious architects and designers, who can offer an affordable substitute. Another new arrival on the Japanese architecture scene is Sendai MediaTheque. 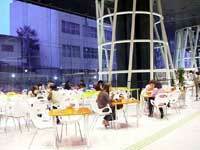 It was opened in January 2001, aimed to be a centre of culture to promote citizen's activities in Sendai. It has some galleries, studios, a local library, cafe, and bookshop. One of the Japanese leading architects, Toyoo Ito designed SMT. Their building is characterised with spiralled steel tubes which hold the building structure. The front of the building looks as though it is only supported with glass. His partner who specialises in calculating dynamics puts his efforts into make realising the architect's idea. I had read an article about it before I visited and I imagined how surprising SMT looked. I had a strong desire to go to Sendai if I had an opportunity and when the chance came, I took it. A Sendai promoter persuaded my friends' band to have a live concert there in Golden Week. Then I had two reasons to travel to Sendai: visiting this new site and going to their concert which would be held there. When I first saw the SMT building from the bus, It did not look so unique. It seemed to be just another fashionable building. Yet when we visited it on foot, I was astonished by its size at the beginning and later I found detail was well designed and I like it. It is impossible to make such a big building in Tokyo. We do not have such a big area here. I admired that the building is very spacious. Along the hall, even on backstage there were wide corridors. However I was not excited so much, because they did not have local uniqueness. It seemed to be another small Tokyo. I am critical to reproduce Tokyo in other parts of Japan. On the ground floor, a cafe and museum shop, which were also original to Tokyo, awaited fashionable customers. It might be easiest way to take Tokyo famous shops to attract young fashion oriented people in other areas in Japan. Anyway Sendai city tries to organise good cultural facilities. They have just started. I wish their exhibitions or concerts would be very unique and reach the high standard in the near future. Frankly to say, the exhibition at that time was interesting although some artists' work had not been shown yet. Besides that, my friends' band's performance was quite successful.